Is your computer running slow? There is usually a reason that happens, let's explore those reasons together. 1) CPU - If your CPU is at or near 100% all the time, a program is doing something is should not be. 2) Memory - Again, is the memory at 100%? 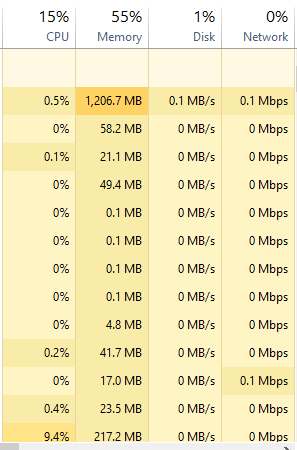 This could indicate you don't have enough memory or you have too many programs open. Try to not have so many open or tabs in your web browser and see if that helps. 3) Disk - This is usually the most common reason a computer goes slow. If your disk is at 100% then Windows can no longer read the information stored there and do what you have asked it to do. With all of these problems, click the % sign and it will organize them by what is using the most. You might have to click it twice. With that done do you see the program causing your problem? If so click on it and then click end task. If you were able to end it that 100% should begin to fall allowing your computer to work again. If this continues to happen or if you can't see what is causing the issue, it is best to consult a professional next as it could be a serious problem.